The front lines of social justice leadership are often stressful places to stand. The causes, the people, the issues, ask a lot of us. They ask the best of us when we’re standing in historic trauma fields – looking to find ways to transform the system, transform the situation, and heal ourselves. We’re looking for the inspiration, the break through into new paradigms that serve our communities. The NEAR Sciences offer a new paradigm that helps both at a personal level, at a community level and at a systems level. 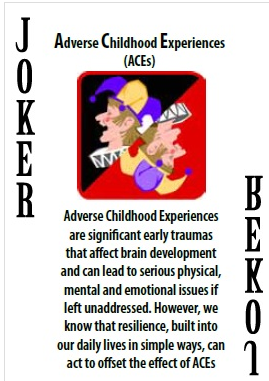 The NEAR Sciences are: Neuroscience, Epigenetics, ACE’s (Adverse Childhood Experience), and Resilience. In Washington State there is a 15 year effort underway to reduce trauma in communities generation to generation informed by the NEAR Sciences. Teresa has been involved in this effort since 2003 and has steeped herself in study of the neurosciences and healing as part of that learning. She’s developed a coaching practice that helps people address their underlying stress responses, she works with individuals, teams and organizations to see how to put these NEAR science understandings into practice. OUR BRAINS: Everyone has holding patterns, triggers, and stress responses. When we are “triggered” by a situation and react, our brains are first wired to keep us safe so our core stress response patterns kick in. Our primitive brain kicks in and we are in “fight, flight, freeze, or appease” responses. Personally or in relationship once we are functioning from the primitive brain new solutions are rarely possible. We literally don’t have access creative thinking or higher level brain function. Learning to work with our triggers – our reactive patterns – is essential to leadership, especially social justice leadership. Learning, as a team, to stay centered with access to our Source, creativity, wisdom, health and new solutions is also core to social justice leadership. The neurosciences and personal mastery practices informed by the neurosciences have a lot to offer. What if toxic stress is one of the underlying social justice issues itself? It’s now shown how toxic stress and Adverse Childhood Experiences (ACE’s) are underlying driver of chronic health conditions. It’s also shown that toxic stress and ACE’s deeply affect our development neurologically, our ability to graduate from school, our ability to hold a job and our ability to be in healthy relationships. 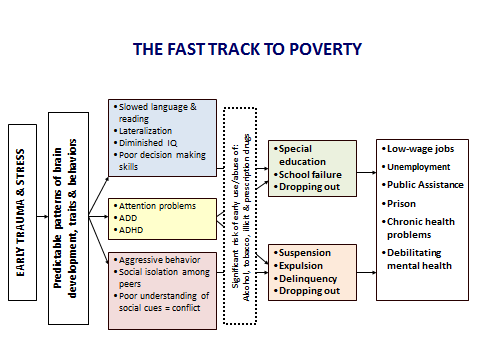 The links to mental health, poverty and homelessness are also evident. Toxic stress in early childhood (ACE’s) leads to increased level of cortisol and other stress hormones in the body. The body has over 1400 stress related chemicals that it can release into the body when we are in a stress response. Shifting our response patterns and practices for working with stress can have huge benefits at every level. Here in Washington State we are learning to create trauma inform systems and communities that respond differently to kids, adults, and families. It’s believed that this will result in significant cost savings over time. Experiments demonstrate a breadth of impressive results including higher graduation rates and significantly improved health outcomes. The good news is neuroplasticity! We can significantly change and re-pattern the neural pathways in our brains. Practices for doing this include a suite of embodiment practices, emotional mastery skills, meditation and mental mastery. In schools this also includes introducing social and emotional learning practices, restorative circles, art and play therapy. We can create new health outcomes, educational outcomes and leadership outcomes for families and the communities we serve. The community of Walla Walla Washington talks about building resilience, not ACEs. (http://resiliencetrumpsaces.org/) They trained the breadth of the community to respond differently to trauma. WA. Their schools changed as a result. Lincoln High School, for example,was the first high school in the country to integrate trauma-informed and resilience-informed practices throughout the school. The results were in an 85% decline in suspensions and a 40% decline in expulsions after the first year. After four years, suspensions had dropped 90%, expulsions dropped to zero, and graduation rates increased five-fold. The movie is about the schools, Paper Tigers is being released in early 2015. When any kind of trauma (something that is emotionally overwhelming) has happened in our lives, it’s common to go back and re-live that, to have that pattern replay in our bodies, emotions and our minds, over and over. We re-traumatize ourselves (diagnosed as PTSD in more extreme situations). Sometimes we’re triggered by a new situation but land in the old pattern. The current situation only has to match the original situation by 5% in order to be an effective trigger. Setting us off down the well-traveled pathway of reaction first imprinted from the original experience. Kind of like landing in old ruts in the snow, it’s hard to get out of. Some patterns that go back to early childhood are rooted in our unconscious mind, so they are triggered even without us knowing it. Until the age of 6 or so, the brain is in a Delta state so those patterns are less conscious than those t from experiences later in life. It’s feels like “who we are.” Those that have been hurt (abuse, neglect, addiction, incarceration in family, etc.) are more likely to live out those patterns again in their own families, impacting partner or children. 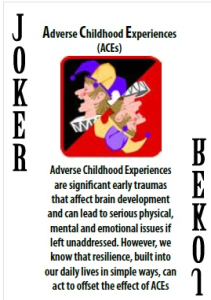 Thus ACE trauma is inter-generationally transmitted. Understanding this brings compassion to our stories, and wisdom to the choice of response. Keep a trigger book. Start to notice the times when your triggered. Write it down. Actively notice when your emotional responses are bigger than the current situation. Pause regularly throughout the day (every hour) and notice what’s happening with your emotions, with your thoughts, and with your sensations in your body. Notice where the patterns come from, notice what repeats. Have a simple centering practice as a “go to” when triggered. For example: Connect with your center (two inches below belly button and back toward spine), place your tough on the roof of your mouth and breath a 4 sided breath (in, pause, out, pause). The neural pathways in our brains can operate a lot like tracks in the snow. Some tracks are ruts, are really deep and well-worn. We can land in them in an instant! These are conditioned neurological and physiological responses. Often, they are there not pathways that lead to new creative solutions, or bring out our best selves. Awareness is the first step. Then we can begin to help our brain and emotional bodies make other choices – to create some new neural pathways, to heal our brains. Recall a situation that triggered a stressful emotion – anger, hate, anxiety, worry, grief, sadness. Choose any ONE. Really take yourself back to that situation and feel what you felt at that time. Then take the shape or sensation of that emotion. Notice what shape your body might make if you could make a statue – expressing different words. These stressful or fear based emotions, often take us into a pattern of contraction- have our body or minds contracting in some way. The fear-based emotions, trigger the lower brain. Our primitive responses are really good at keeping us safe (fight, flight, or freeze). They are meant to get us out of danger and help us survive. They’re not very sophisticated though in helping us to thrive. Now recall a situation in which you felt a positive emotion. Again, really take yourself back and feel what you felt then. Now see what shape your body makes. Create a statue/embodiment for love, or peace, or joy, creativity or happiness. The love-based emotions are expansive. They access the frontal cortex of our brain. They access our higher brains which support us in creating new solutions – opening our own minds to higher levels of thinking. They open us also to connection with others and our spiritual resources. The healing magic is in developing a suite of practices that help us foster well-being at every level -physical, emotional, mental, and spiritual. Many social justice efforts have called on our spiritual strength and spiritual oneness. Historic figures also demonstrated well-developed personal mastery practices to support them in transformational efforts amidst adversity. Physical well-being: Getting to how – precisely – the patterns of stress in our bodies is powerful awareness. Bringing our kind attention to our beautiful physical bodies – noticing when the body is in a holding pattern, a stress response. Knowing also what are underlying patterns or practices of well-being and how to do more of that. Opening the window of awareness so our physical body can be a friend, teacher, leader in discovering new choices for how we are in our bodies – Starting to release the holding patterns that are present. One well established practice of healing focused on the physical is the field of Somatics. All the experiences in our lives are held in our bodies. Those stories are in the cells, the DNA, the muscles and the familiar stress patterns. Our body is an amazing teacher if we listen and attend to the stories wanting to be told. Emotional well-being: Core emotional patterns were imprinted very early in life and are stored in our unconscious. It can be quite surprising to set a timer for every hour and just notice what’s happening – what is the emotion(s) present. Learning to find the words that reflect the emotion is sometimes a big learning curve in itself – it’s common to be disconnected with our emotional bodies and emotional wisdom. The work of Emotional Intelligence shows how emotions can be teachers, navigation instruments, and powerful communication tools. Emotional mastery includes practices for healing our emotional bodies, clear old emotional energy and challenging emotional patterns. The memory of an emotionally overwhelming experience in life can be is stored in the physical body and the emotional body. Physical health is closely connected to emotional health. Emotional holding patterns can have significant impact on health (see ACE’s FACT sheet). Joey Klein’s work in the Inner Matrix (see References) is a wel-developed set of meditation practices that is trauma informed and supports the healing of the emotional body and triggered response patterns. Mental well-being: Our thoughts are profoundly powerful. If we can align our mental body clearly with our intentions, efforts will be more successful and personally more sustainable. But how do we get out of stress brains, or rat race brains. We have 60,000 thoughts a day, what percentage are fear or stress based? What percentage are we conscious of? Meditating 20 minutes a day starts to significantly shift our mental patterning, the core neurological activity of our brains (see Article: “Your Brain on Meditation” By Diane Breneman). There are also practices of working directly with thoughts such as the work of Byron Katie which encourage meeting our stressful thoughts and turning them around. A curious place is the gap between emotions and thoughts, a pause in the space between. We are not our thoughts, we are not our emotions. This normally untended gap is key. When emotional patterns are triggered our thoughts are what reinforce the pattern. It’s almost as if the mind was looking for evidence that reinforce the underlying emotion. Creating a gap happens when we bring awareness between what’s happening in our emotions and what’s happening in our thoughts. Our emotions on their own, if not fed by our thoughts, last neurologically for 90 seconds. Tending to emotions in this “small” way – is a lot kinder than the “large” ways they can act out or play themselves out in our lives. Spiritual well-being: –What if we have abundant help? What if we have tremendous resources available from the spiritual world? What if we have access to profound intuitive wisdom? Leadership is spiritual – fostering our access to a deep inner knowing and intuitive wisdom is leadership. Personal mastery and spiritual practices allow us to consistently access more of our brains creative capacity and create partnerships with the spiritual world that will consciously energize our efforts and help us come together on behalf of life. How do we develop individual and team practices to support healing & creative brilliance in times of uncertainty and radical change? What becomes possible as the impact of toxic stress is clear as a root causes for many health and social justice issues? What happens as personal mastery skills become central to our development as social justice leaders? What if there is a cohort of Leading from the Heart leaders that join together to inspire and support each other in their next level of vision, well-being, and work. What is Your ACE Score and How Does it Relate to Resilience?